Like everything in life, Taurus wants to roll up their sleeves and do things right. Everything is a hands-on experience, and worth investing their complete attention. I think this is why they’re such great cooks. They have such a sensitive and refined palate and a true appreciation for quality. They understand that not only are the best things in life worth the wait, that chances are the wait is why they’re the best. Why else would we need reservations at really good restaurants? Why do we long for the food of our childhoods, like mom used to make, back when mothers actually cooked? (OK, maybe some of you are too young for that.) Well, I grew up when mom’s really cooked. Busy lives and time shortages have led us to rely on drive thru, delivered, pre-packaged, instant, frozen – you name it, but we’ve gotten further away from not only the preparation of our food, but the source of it – the earth. This is a sign of hearty food – meat and potatoes, the kind that stick to your ribs, leave you feeling satisfied and ready for a long nap in the pasture. But above all, the kind of food that takes time, effort and intention to prepare. Your taste buds will reap the benefits. Sun and soil. When you think about it, just about everything we eat comes back to this magical duo. Produce is filled with the energy of the sun and minerals absorbed from the earth. If you’re going to take the time to cook, also take the time to choose the best ingredients possible. Don’t just grab a plastic bag and blindly fill it with vegetables. Look them over; examine them for color and quality. Does the tomato smell like one? If it doesn’t chances are it won’t taste much like one either. 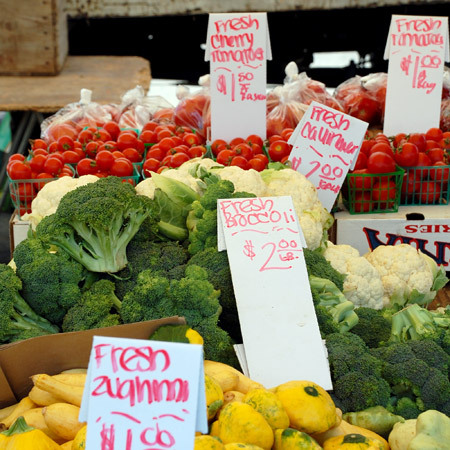 If you happen to live in a town with local farmers markets, do some (if not all) of your shopping there. When you get to meet the people who grow your food you can learn important facts like, do they use pesticides? (You are what you eat. Just saying.) Not to mention the food will be fresher than most in grocery stores and you’ll be supporting local farmers – you won’t find nicer folks to feed you. (Hurray for the little guy!) Some of you are lucky enough to have a plot of yard you call your own; so why not grow your own garden? (If you do, well, color me jealous.) Nurseries have a vast selection of seeds for all kinds of vegetables and herbs, as well as a pretty good selection of young plants. You can have the freshest of all produce sections growing outside your window in no time if you’re willing to get a little dirty. Instead of pulling out that fancy food processor with the slice and dice attachment, pull out a good knife and do some good ol’ fashioned chopping. Mixing your own salad dressing instead of opening a bottle. Why not bake a loaf of homemade bread? No, I don’t mean throwing the ingredients in a bread machine and waiting an hour. 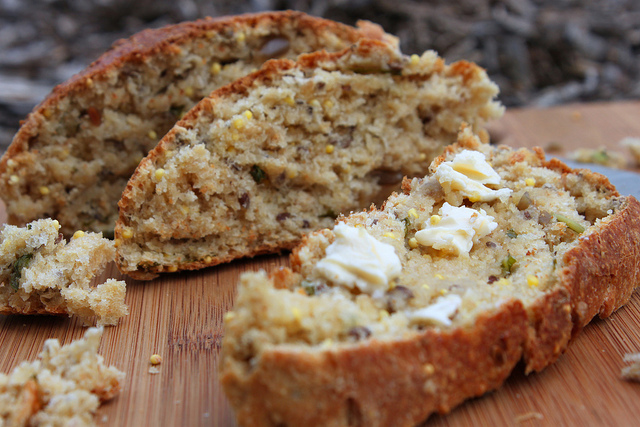 Try making bread from scratch, which isn’t nearly as difficult as it sounds. It just takes precision and attention, like making sure the water is the right temperature for the yeast. 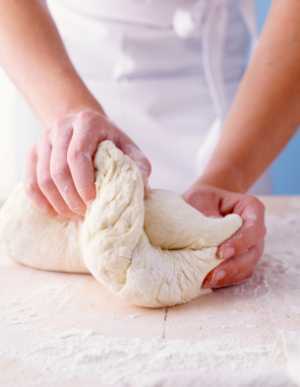 The dough needs time to rise, and you need to roll up your sleeves and get your hands in there and work it. It’s a sensual experience with your food and leaves you feeling such a sense of accomplishment. As a bonus, the whole house will have the homey smell of fresh baked bread. You just can’t bring that home from the grocery store. Marinate – it originates from the Italian word marinato which means ‘good food takes time’. Not really, but it should, because it’s true. The most succulent and tender meats taste that way because of their preparation; rarely due to the way they were cooked. A fine cut of meat deserves the right blend of spices to bring out the best flavor. (Just please don’t tell Bessie!! See DLYS! Pisces) Marinated, dry rubbed, or even slow cooked in a Crock Pot will infuse the flavors to make it worth the wait, while filling the house with the smell of slow roasted goodness. When was the last time your house smelled like home cooking? 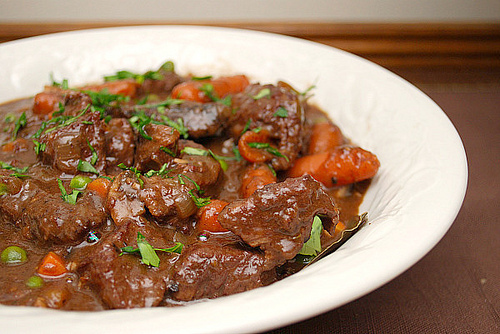 This intensely flavorful recipe from Bobby Flay is one of my favorite recipes EVER. Combine all spices in a bowl. Season one side of each filet with a heaping tablespoon of the rub. Heat the oil in a large sauté pan over high heat until smoking. Place the filet in the pan, rub-side down and cook until a crust has formed, 2 minutes. Turn the steak over, reduce heat to medium and continue cooking to medium-rare doneness, about 6-7 minutes. 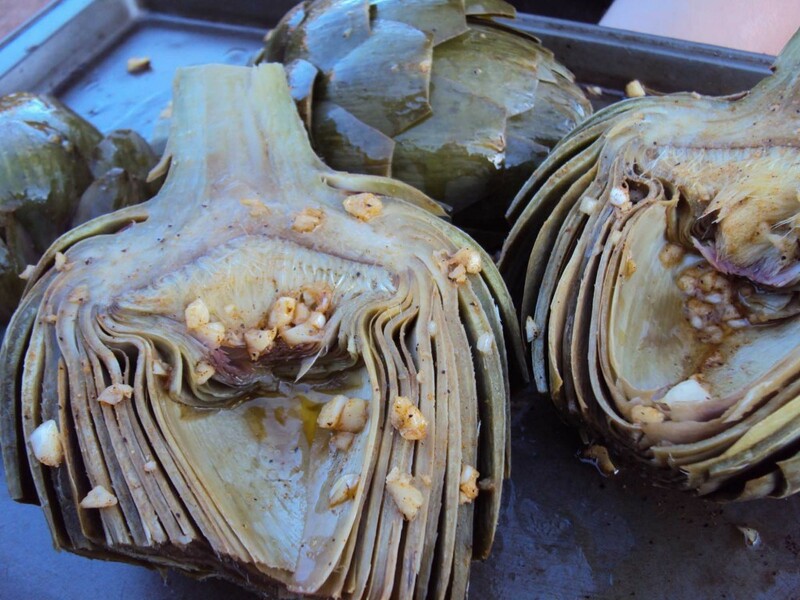 Remove from the pan and let rest 5 minutes before serving. Place chicken stock in a medium saucepan over high heat and cook until reduced to 2 cups. Heat oil in a large sauté pan over high heat. Add the mushrooms, shallot and garlic and cook until the mushrooms are golden brown and liquid has evaporated. Whisk the ancho puree into the reduced chicken stock then add to the pan with the mushrooms. Bring to a boil and cook until the sauce is reduced by half, stirring occasionally, approximately 15-20 minutes. Season with honey, salt and pepper then fold in the cilantro or parsley. Ladle sauce onto plates and top with steak and drizzle with smoked red pepper sauce and sprinkle with chopped chives. * Ancho puree – soak 3 ancho chiles in boiling water for 30 minutes. Remove the chiles from the soaking liquid, remove stems and seeds and puree in a blender with some of the soaking liquid until smooth. Mashed potatoes? (Yawn) They are so last sign. Here’s a colorful sweet and savory side dish to compliment that finely prepared meat. Melt margarine in a large saucepan over medium heat. Add onion and sweet potatoes; sauté 5 minutes. Add mustard and remaining ingredients; bring to a boil. Cover, reduce heat, and simmer 20 minutes or until sweet potatoes are very tender. 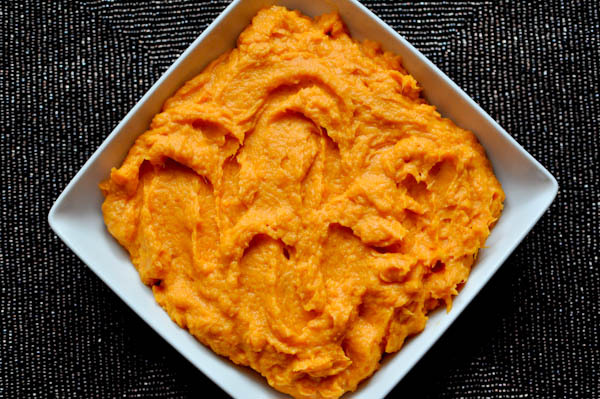 Place sweet potato mixture in a food processor; process until smooth. Adjust oven rack to lower-middle position and heat oven to 300 degrees. Pat meat dry with paper towels and season with salt and pepper to taste. Heat 1 tablespoon vegetable oil in large heavy-bottomed Dutch oven over high heat until just starting to smoke. Add half of beef and cook until well browned on all sides, about 8 minutes total, reducing heat if oil begins to smoke or fond begins to burn. Transfer beef to large plate. Repeat with remaining beef and 1 tablespoon vegetable oil, leaving second batch of meat in pot after browning. 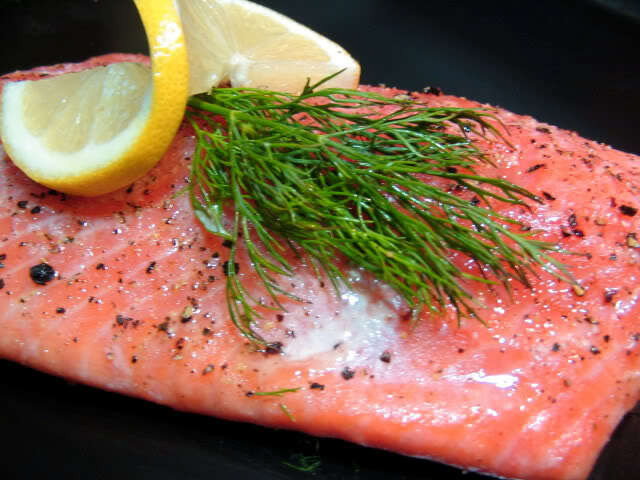 Bring salmon fillets to room temperature. Adjust a rack to middle third of oven. Preheat oven to 250 degrees F. Mist an 8 x 11 x 2-inch baking pan with nonstick cooking spray. Place scallions in bottom of baking pan to form a bed for the salmon. Cover with dill and lemon slices. Place salmon, skin-side down, on top lemons. Squeeze lemon juice over all. Brush fillets with oil; sprinkle with salt and pepper. Lightly top with more dill and lemon slices. Allow to sit at room temperature for 1/2 hour if time permits. Bake in preheated oven for about 30 to 35 minutes, or until fillets can easily be pierced with the tip of a sharp knife. Carefully transfer to a serving platter. Remove topping and garnish with some fresh dill and a lemon twist. Yield: 4 servings. Soak millet in 1/2 cup warm water for 20 minutes, set aside. In a separate bowl add 1/2 cup warm water and sprinkle yeast in. Add 2 tsp. of honey and whisk together until combined. Set aside for 10 minutes, or until foamy/frothy. In a separate bowl add flours and salt and whisk together. Once yeast is ready, pour yeast into a mixing bowl fitted with dough hook. Add melted butter, 1 1/2 cups warm water, and 3 TB maple syrup. Mix until combined. Then add 3 cups of flour mix. Mix on low speed until smooth. Then add in millet (plus water in bowl), and the rest of the seeds/oats, and basil. Mix at low speed until combined. Then add remaining flour until dough is combined and somewhat smooth. On a floured surface kneed dough for about 5 minutes until a smooth ball forms. Place dough in greased bowl and cover with plastic wrap. Let rise for an hour or so. When dough has risen, punch down in the center, then divide dough into about 6 or 7 balls. Form balls and place on cookie sheet fitted with a cooking mat. Take your egg white, and add a little water, and brush the tops of the dough balls. Then cover baking sheet with plastic and let dough sit for about another 1 1/2 hours. Pre-heat oven to 400 degrees, and when the dough is ready, Bake for about 22-25 minutes, rotating pan halfway through. Grease a 9x5x3 inch loaf pan with butter. Once the dough has doubled, add the hazelnuts, chocolate, butter and the egg, knead the dough on a lightly floured surface for a few minutes and shape to fit into a loaf pan. Cover the dough with a tea towel and let it rise for about 30 minutes. 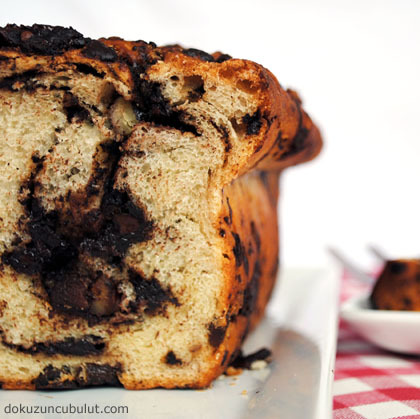 Preheat the oven to 350F; bake loaf for 30-45 minutes, tent with aluminum foil if the top gets too dark. Cool the baked loaf on a wire rack and serve slightly warm. If you have leftovers (Leftovers? what are those…? ), wrap in aluminum foil and warm in an oven preheated to 275F. In large bowl, stir together the flour, sugar and salt. Cut the shortening in with a pastry blender until crumbly. In small bowl, beat together the water, vinegar and egg. Add to flour mixture. Stir until all ingredients are moistened. Divide dough into 4 or 5 portions and flatten each into a flat round patty ready for rolling. Wrap each patty in plastic and if using any of them right away chill for at least ½ hour. Otherwise freeze the others and remove from freezer about 30 minutes before using.On lightly floured surface, roll out dough to a 13-inch circle about 1/8 inch thick. Line 9-inch glass pie plate with pastry, trimming overhang to about 3/4 inch. Place in refrigerator. Preheat oven to 425 degrees. On a piece of parchment, roll out second disk of dough just like the first. With a straight edge and a knife or pizza cutter, cut the dough into 10 even strips about 3/4 inch wide. Transfer, on the parchment, to a rimless baking sheet, cover with plastic or parchment, and refrigerate while preparing filling. All-butter pastry is fussy about being kept cold! Peel peaches (or not, if they’re thin-skinned and smooth like these) and slice into a large bowl (I use a 2-quart glass measure). You’ll have about 6 cups of sliced peaches. 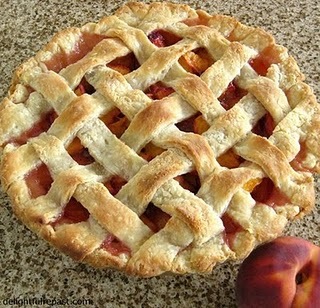 (I slice them like this: Quarter peach, cut each quarter into 4 wedges, cut wedges in half.) In a small bowl, whisk together sugar, cornstarch, salt and spices; add to peaches and mix gently but well. Pour into pie shell. Working from the center, lay 5 strips of dough across the pie in one direction. Fold back every other strip halfway. Place a long strip of dough in the center going the other way. Unfold the folded strips over the crossing strip. Repeat with remaining 4 strips. Trim the overhanging strips even with the bottom crust and crimp the edge. Place a foil-lined rimmed baking sheet in the middle of the oven to catch any drips, and place the pie on the baking sheet. Bake at 425 degrees for 30 minutes. Lower temperature to 350, and bake for an additional 35 minutes (juices should be bubbling). Cool on wire rack for at least 2 hours before serving. You sound like an incredible cook, LeeAnn. So, you have fed all of these dishes to Taurus? Somehow I can’t picture a bull eating salmon, but maybe I’m just stereotyping. What fabulous recipes! And you are so right –Taurus is the gourmand of the zodiac – they love good food but they are not food snobs. They like anything if it is excellent. Great apple pie from a truck stop – they know where to get the best bread – the best coffee – the best produce etc. etc. I’ve had the pleasure of LeeAnn’s cooking and baking and she is an Artiste. I’d be at her restaurant every night!